The end of this part of A Court of Thorns and Roses is finally there. 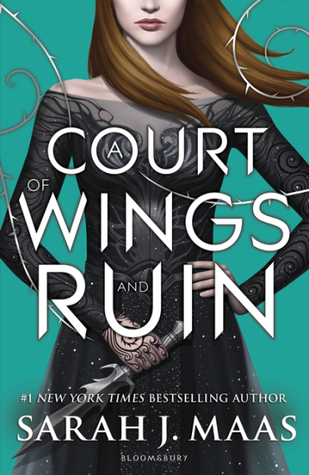 I have been looking forward to A Court of Wings and Ruin for so long, I need to read it as soon as it got here. I give A Court of Wings and Ruin five out of five hearts. It was completely what I expected it to be and more. I loved it from start to finish and it was a refresher since most of what I have read the last couple of months had a lot of boring bits, ACoWaR completely not! I loved it. The entire book felt like a roller-coaster, with around every corner a new unexpected bent. I loved it so much. Feyre’s sisters, which I did not care for that much during most of the other novels I actually started to like over this novel. They have changed so much since I got to know the spoiled brats in A Court of Thorns and Roses, I had trouble recognising them in the end. The Bone Carver, The Weaver and the other creatures are really original and I enjoyed them a lot. Feyre and her sisters are so strong! They do not relay on the men/Fey to save them from anything. They are very good examples of great female independent characters. They do need others to finish the final battle, but it also showed they could safe themselves. A lot of the characters whose choices I hated in the earlier novels, made up for their bad choices in this novel, which took some of my respect back to them. I loved the battle at the end, it was fun and fast. It did not take forever to get anywhere even though it sounded like it took awhile to in time. But it is not like The Hobbit, that just hits the main character of the head at the start of the battle to only wake up after the battle (I hated that!). It felt so intense! I also liked the library a lot! It was so original and made me feel so warm inside. The only thing I did not like happened at the end of the novel. Rhys makes really big sacrifice and it just gets undone after a little bit of time. WHY? People, it is okay if someone does every once in a while! You do not have to kill everyone off to join the hype of George R.R. Martin or no-one because you think it is too scaring, or something. But when you make the decision to kill a character off, PLEASE leave them that way and have the characters learn to deal with that! I loved A Court of Wings and Ruin and thought it was a great end to a great trilogy. I think it does not really need the planned 3 other novels. But whatever. Sarah J. Maas wrote a very fun and fast paced novel, which she usually does, but this one has been the best of all of her novels. This entry was posted in Book Review and tagged Adventure, Book Review, Fantasy, Mystery, Romance, Sarah J. Maas. Bookmark the permalink.